We at ANGLER seek for better ways to exhibit our innovative products to key decision-makers and buyers. We take pleasure to make our active presence in this one-of-a-kind event featuring global technology pioneers on the planet. 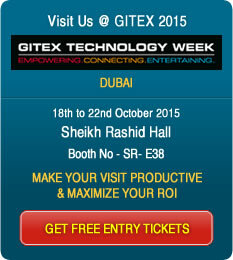 ANGLER Technologies being a leading Offshore Software Development Company have plans to participate at 35th GITEX Technology Week 2015 in Dubai, scheduled to happen from 18th to 22nd October 2015 at Dubai International Convention and Exhibition Centre, United Arab Emirates (UAE). Reckoned as a must-attend event for tech enthusiasts and industry professionals we don’t miss and continually participate in this trade show event for the past 9 years. This is the 10 year we are participating in this tech trade event to showcase our innovative products and solution offerings to customers & prospects in the Middle East & GCC region. We have years of experience in handling outsourced IT offshore projects for a wide range of companies. With significant talent and exceptional service we serve clients all over the world, across all industries. To keep pace with the challenges ahead register with us online and get free tickets to meet us at the Booth No: SR – E38, in Sheikh Rashid Hall in Dubai. PHP / MySQL, RoR, WordPress, Joomla, Magento, Drupal, etc. We always look to this tech trade event as critical for our business to contact the targeted group of customers. This tech trade event also gives us a chance to meet with and consolidate our relationships with our channel partners existing vendors and meet new vendors to grab big business deals. Partner with us & see how ANGLER Technologies could be of value addition to your business.